Pokemon Go players might be in for a huge surprise as creator Niantic has announced on its official support page that in-game gyms will soon be closing temporarily. While the company stopped short of dropping any explicit hints about what changes players can expect, it mentioned that “remodeling” is the reason behind the temporary closing. 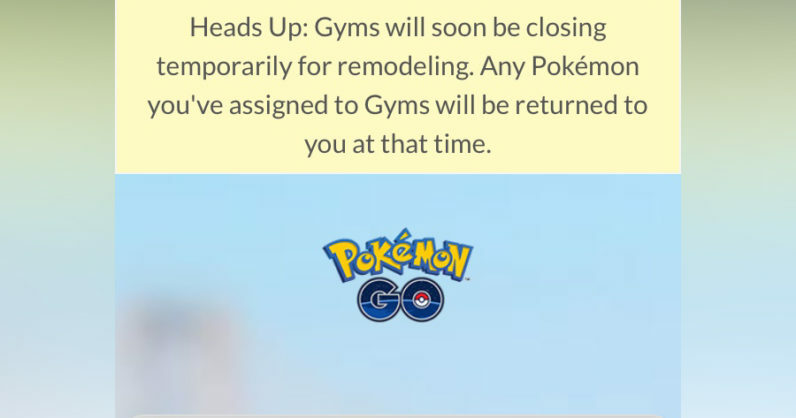 “Heads Up: Gyms will soon be closing temporarily for remodeling. Any Pokémon you’ve assigned to Gyms will be returned to you at that time,” the support page reads. As we get ready to update Pokémon GO, we want to ensure that Trainers have a sufficient heads up that Gyms will soon be disabled so that they can collect their Defender bonus. We will provide updates on our social channels in advance of Gyms closing in-game. Earlier in May at our TNW Conference in Amsterdam, Niantic CMO Mike Quigley alluded to the possibility of adding new collaborative features to improve the multi-player aspect of the game. “You know, the gym mechanic is something in Pokémon Go which we really, really want to improve, so that’s gonna be the next big area for us,” he commented. No word on when the remodeled game is expected to roll out, but Niantic is no slouch when it comes to updates – so you probably won’t have to wait too long.